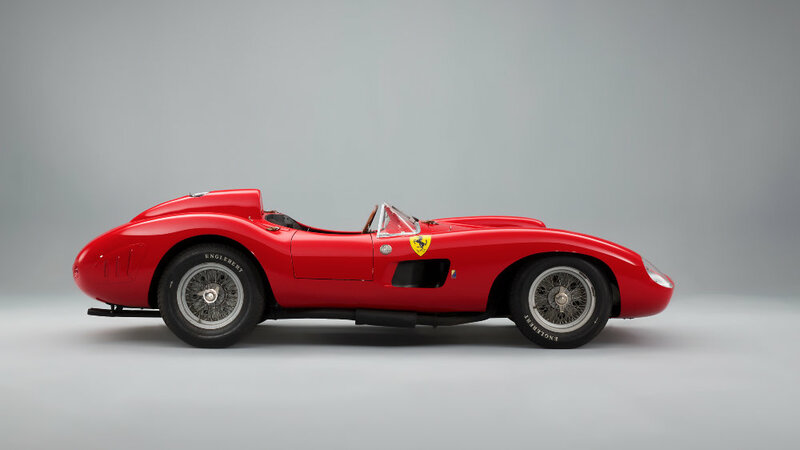 A 1957 Ferrari 335 Sport (estimate $30 to $34 million) could become the second most-expensive car ever sold at auction at the 2016 Artcurial Paris sale. A 1963 Ferrari 250 GT SWB Berlinetta is expected to sell for over $10 million at the tradition Rétromobile classic car auction in February. Three interesting Bugattis from the 1990 will also be on offer. Several further Ferraris, two Lamborghinis, a Porsche, Bentley, Alfa Romeo and Aston Martin are also likely to sell for over a million dollar. Artcurial will hold its traditional Paris classic car auction on 5 and 6 February 2016 during the Rétromobile week. On offer will be around 170 cars including 50 for a special Citroën marque sale. In 2015, the Artcurial Rétromobile sale stole the headlines with the Baillon Collection of barn finds including a model record $18 million for a 1961 Ferrari 250 SWB California Spider. In 2016, the 1957 Ferrari 335 S Spider and 1963 Ferrari 250 GT SWB Berlinetta are likely to achieve the highest results for Artcurial. The 1957 Ferrari 335 S Spider with body by Scaglietti, chassis no. 0674, on offer at the Artcurial Salon Rétromobile sale is likely to become one of the most-expensive cars ever sold at public auction. If it reached its pre-sale estimate of $30 to $34 million (€28 – €32 million), it will only be second car ever to sell for more than $30 million at a public auction. The 1957 Ferrari 335 S Spider, chassis 0674, was an official Scuderia Ferrari racing car. It left the factory in Maranello as a 315 S with a 3.8-liter V12 Tipo 140 engine producing around 360 bhp. As a works 315 S entry, the Ferrari was driven to sixth place by Peter Collins and Maurice Trintignant at the Sebring 12 Hours. 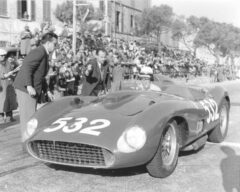 More famously, the Ferrari was driven by Wolfgang con Trips in the 1957 Mille Miglia to second place, behind Pierro Taruffi’s winning Ferrari. Ferrari subsequently upgraded the car to a 335 S by fitting a 4.1-liter engine capable of 400 bhp and a top speed of around 300 km/h. Mike Hawthorn and Luigi Musso drove the car at the 1967 24 Heures du Mans. Hawthorn here set the first lap record at Le Mans ever above 200 km/h (203.015 km/h average) but retired with mechanical issues after five hours. The same drivers took the car to fourth at the Swedish Grand Prix and second at the Venezuela Grand Prix to help Ferrari win the World Constructors’ Title in 1957. In 1958, Ferrari sold the car to Luigi Chinetti, the New York-based Ferrari importer. Stirling Moss and Masten Gregory drove the Ferrari 335 S to victory at the Cuban Grand Prix. It participated in further American races mostly driven by Gaston Andrey and Lance Reventlow. The 1957 Ferrari 335 S Spider Scaglietti has been in the Pierre Bardinon Collection in France since 1970. The 1963 Ferrari 250 GT SWB Berlinetta, chassis 4065GT, (estimate €9 – €12 million) on offer at the Artcurial Paris 2016 sale was the last of 165 built. The steel-bodied car designed by Pinin Farina but built by Scaglietti was not raced in period. However, while being owned for over the past three decades by the Midy family, it was a regular sight at classic rallies in the 1990s and 2000s. The car has never suffered an accident and is in good but not over-restored condition yet definitely not a barn-find like the Baillon California Spider. 1960 Ferrari 250 GT Cabriolet Series II by Pininfarina – originally owned by Prince Moulay Abdallah, the younger brother of King Hassan II of Morocco – this cabriolet comes with a built-to order stainless steel hardtop. It has been in the Adrien Maeght collection since 1985. 1986 Ferrari Testarossa Spider Valea – this car aims high but then it was the personal car of Gianni Agnelli and the only Testarossa Spider Ferrari ever built. 1972 Ferrari 365 GTB/4 Daytona – several of these models will aim at a million dollars at Scottsdale 2016 and one at RM Sotheby’s Paris 2016 but they usually fall just short. This matching-numbers example has been completely restored and comes with Ferrari Classiche certification. 1971 Ferrari 365 GTB/4 Daytona Spider Conversion by Straman – Daytona Spiders usually sell for around $3 million but this non-factory conversion would be lucky to reach a million. It is helped by only having covered 30,000 miles since new and having been owned by the same family for over four decades. Pastor used a 1995 Bugatti EB110 Super Sport to set a new ice speed record of 296.34 km in 1995 – a record only bettered in 2013. The second Bugatti EB110 SS “Sport Competizione – Le Mans” was prepared to race at Le Mans 1996 but crashed during practice and would not be repaired in time to participate in the actual race. The 1999 Bugatti EB112 Berline is one of only two ever made. Pastor created these cars from the spares he bought when Bugatti went bankrupt in 1995. The car is fitted with a 6-liter, V12 engine producing 455 BHP to propel the saloon car from 0 – 100 km/h in 4.4 seconds and a top speed of 300 km/h. 1929 Alfa Romeo 6C 1750 Super Sport – a meticulously restored car with attention to detail to simply give the appearance of a well-maintained, original car. Similar Alfas attracted high prices at recent auctions although reserves are not always met. 1963 Aston Martin DB4 Convertible Series V – only 70 DB4 Series V Convertibles were made with this example one of only 19 left-hand drive examples. In addition to the Bugattis, four further cars from marques now belonging to the Volkswagen Group are aiming to achieve over a million dollar at the 2016 Artcurial Paris sale. The 1975 Lamborghini Countach LP 400 Coupé “Periscopio” was the 55th Countach produced. It is a matching numbers example but the color changed from red to black. The 1970 Lamborghini Miura S had the same owner for the past 35 years and although the car has never been fully restored, it is not in as an original condition as the market currently prefers. 1988 Porsche 959 – a fine example in original, well-maintained condition and less than 15,000 km on the clock. Porsche 959s have been present at many auctions lately and usually achieve over a million dollar. 1926 Bentley 6.5L Tourer Vanden Plas – a matching numbers example with the original engine and mechanics but he coachwork has been changed a few times during its 90-year life. Bonhams and RM Sotheby’s will also have classic car auction in February 2016 in Paris during the Rétromobile week.